The Rat Terrier was originally used for vermin control and for hunting, although today it is mostly kept as a companion. When on the hunt it works as a treeing dog, meaning it was developed to track it's prey and then force the animal into a tree. Once it is treed the dog will continue to bark until the hunter makes the kill or the dog is called off. 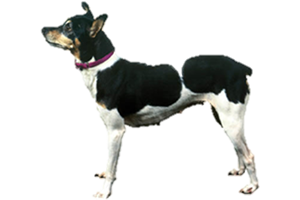 The history of the Rat Terrier actually begins in England with crosses that included Manchester and Smooth Fox Terriers, among others. These dogs were created to excel at rat killing and when emigrants came to the United States in the 1890s they brought their dogs with them. They continued to develop in their new home and became popular later when Theodore Roosevelt kept several he took hunting. These dogs also worked as ratters in the White House and it was Roosevelt that gave them their current name. Overtime more breeds were added, such as the Beagle and Whippet, plus back crosses again to the Smooth Fox Terrier. Eventually two varieties were created, one with long legs and the other with short. (Much like the modern day Jack Russell and Parson Russell Terriers.) The United Kennel Club now recognizes the short legged variety as the Teddy Roosevelt Terrier, although it is the only kennel club to do so. Is the Rat Terrier Right for You?